What's wrong with Aaron Nola? Coming into the season, he was the least of the Phillies' worries, the one pitcher in the starting rotation without even a hint of a question mark next to his name. Now, after four starts that have ranged from lackluster to poor, he heads the list of Phillies' concerns. Nola was tagged for seven hits, three walks and five runs in just four innings in the Phillies' 7-6 loss to the New York Mets in 11 innings on Monday night (see observations). The Mets, 46-22 at Citizens Bank Park since the start of 2012, scored the go-ahead run on a fielding error by first baseman Rhys Hoskins with two outs in the top of the 11th. It was the second time in the young season that he'd made a late error that led to a loss. "I have to make that play," Hoskins said. "I need to get in a better position to field that ball cleanly and I didn't." The Phillies had chances to win the game but they left the bases loaded in the eighth when Bryce Harper followed a four-pitch walk by popping up on the first pitch, and in the 10th when Jean Segura struck out on a pitch off the plate with a runner on third. 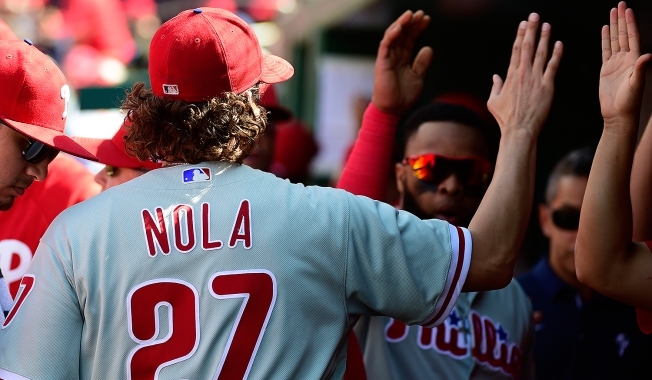 Even if the Phillies had managed to pull off the win, the story would have been Nola. He's that important to this club. And right now he's not himself. Nola finished third in the National League Cy Young voting last season. He ranked fourth in the majors with a 2.37 ERA. Now, four starts into the new season, he has the highest ERA among qualifying big-league starters at 7.45. He has given up 21 hits and 11 walks in 19 1/3 innings. Last year, he was among the best in baseball at getting ahead of hitters; he threw a first-pitch strike 69.4 percent of the time, which ranked second in the majors. So far this season, he's thrown a first-pitch strike just 47 percent of the time. OK, here's the most important question: Does Nola, who pitched a career-high 212 1/3 innings last season, have a health issue? "No health concerns," manager Gabe Kapler said. "My body feels fine," Nola said. "My arm feels good. I'm healthy. That's the main thing for me. I feel like if I'm healthy, I can make strides." Even back in his days at LSU, Nola was a guy who could hit a gnat's backside from 60 feet, six inches. That pinpoint command of the baseball is missing right now. "I'm not making quality pitches when I'm in the zone," Nola said. "It's resulting in balls out of the park, balls in for extra-base hits and scoring runs." Nola's fastball velocity is down a tick from its average of 92.7 mph last season but Kapler said that was not a concern. "I'm concerned about his command," Kapler said. "His command is his calling card. He's just not throwing the ball where he wants to throw it right now. It's hurting him. "He's got movement, deception, life - those things are still there. He just needs to put the ball where he wants to throw it. "I'm concerned that Aaron is not getting where he wants to go. If he was sitting right here, I'd say the same thing to him. The flip side of that is the obvious, which is that he has a long track record of success. He's not the only good starting pitcher that has had some early-season struggles, and we are going to do everything in our power to help him get back on track. He deserves as much confidence as anybody does. It doesn't mean that it feels good to watch him struggle by any stretch. It's also very true that this is an excellent major-league pitcher that deserves the benefit of the doubt here." Kapler was asked what he and the coaching staff would do to get Nola right? "Everything," he said. "All the things that we normally do. Watch video with him, analyze the movement on his fastball and his curveball and his changeup, help ensure that he's in peak physical condition. There are no tricks. There's no switch that you can turn on. Just give him all the support in the world, ask him to be the best he can be." Nola admitted that his struggles are a little baffling. "Yeah," he said. "It's been a tough go so far. I'm not going to hang my head about it because there's a lot of baseball left. I'll still go out there and compete." Nola's next start is slated for Saturday night in Denver and that's not exactly an ideal place for a struggling pitcher to get right.